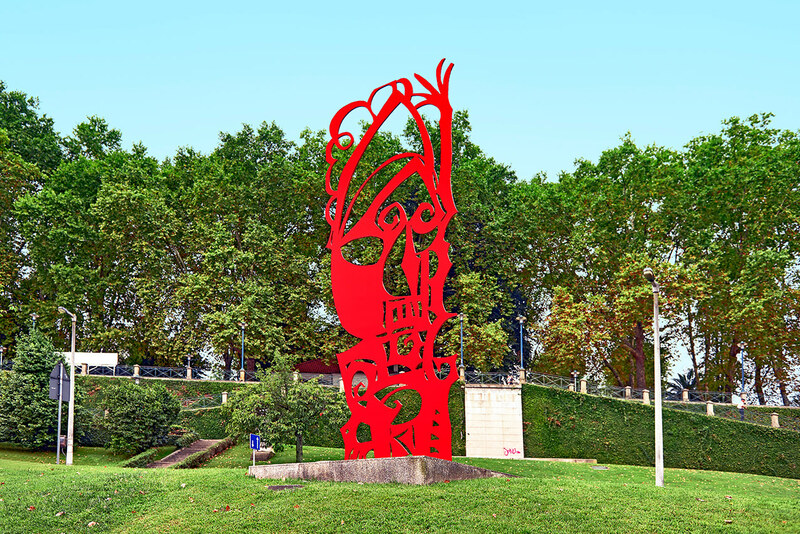 Conspicuously expressionistic, A-SunWu’s piece for the Santo Tirso 6th Symposium is made of bright-red painted iron. Its smooth, flat surface, developed along a vertical, volumeless plane, surprises the viewer like an obvious truth, thus challenging one of the main characteristics of traditional sculpture. On the other hand, its red colour, while symbolising loyalty and eastern virtues, is also associated with protection against negative energies and evil spirits. In addition, the gestural representations may be pointing to the Chinese art of calligraphy and the quick, delicate brushstrokes of Indian ink. When seen under the sun, however, there appears on the ground a clearly outlined shadow, reminding the viewer of the art of paper cutting, the shadow theatre, Chinese screens and architectural fretwork, which for centuries have characterised the essence of eastern art. Living between Paris and Taiwan since the early 1990s, A-SunWu has produced a significant body of work, particularly mixed-technique paintings and sculptures, owing their expressive, and somewhat disturbing, vitality to the use of vibrant colours and fragmented geometric forms, with an occasional humorous touch. A Sun-Wu’s oeuvre has felt the influence of primitive art — African tribal masks and other artefacts, for instance —, which locates it at the borderline between abstraction and representation, human and beast, definite shapes and symbols.